Nancy Nally, lovingly known as “The Nana,” passed away in the care of family on Saturday, March 26, 2016, following complications of dementia. She was born on January 19 to Leo and Florence Dirkman and lived most of her life in Toledo, Ohio. She attended St. Catherine’s School of Toledo for first through third grade, Mary Mother of Mercy School in Pitman, New Jersey for fourth through eighth grade, and high school at Central Catholic of Toledo. In 1950, she married James Edward Nally. Together they raised three children, Kathryn, Sharon, and Michael. During their early years of marriage and family, the Nallys lived on Gould Road in Toledo, where life was never dull and every neighbors’ house was every neighbors’ house. In 1964, Nancy and Jim moved to Glen Ellyn Drive in south Toledo. In 1966, Nancy returned to working, first in the accounting department of Sears and Robuck, followed by the accounting departments of Food Town and later Paul Inman Food Brokerage Maumee, Ohio. During her retirement years she worked seasonally at H & R Block as a receptionist. Nancy served as a greeter at masses at St. Patrick’s of Heatherdowns. She volunteered with the Toledo Police RSVP program whose role was to check on homebound and at risk Toledo citizens. One of Nancy’s least-kept secrets was that of her self-appointment as a family shadchan. If you were single and were of post college age, it was not happenstance to find yourself strategically seated opposite her dinner table to her chosen one for you, nor a coincidence that at any gathering for Nancy to have invited an eligible suitor to stop by. The introductions themselves were less than subtle and were as if she all but had a wedding dress and tux at hand. Nancy had one sister, Janet and brother-in-law Richard Brown, whom she spent many summers visiting at the lake and at fall apple orchard harvest time. She loved her nine grandchildren and was borderline boastful of their success and happiness in various careers. Nancy saw herself fortunate to have two kind and good men as sons-in-law, Mark Bruss and DeWayne Evans who she truly loved as sons. 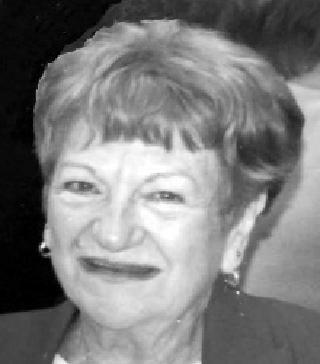 Nancy chummed her way through life, laughing with neighbors and friends, especially her quartet of lifelong friends, Marilyn, Marcy, Jayne and Joanie. Nancy valued her friendships with these four women, for these friendships were not only of laughter but saw her through her most difficult times, the devastating death of her son Michael (1975), the passing of her husband James (1989), and sorrowful loss of her daughter Kathryn Bruss (2003). She was also preceded in death by her parents, Leo and Florence Dirkman. Nancy is survived her daughter, Sharon (DeWayne) Evans, along with their daughters, Zoe and Mae, and by her daughter Kathy’s husband, Dr. Mark Bruss and their seven children, Pamela (Jedd) Frankforther, Dr. Andrea (James) McCartney, Dr. Patrick (Melissa) Bruss, Brett (Stacey} Bruss, Dr. Mitchel (Megan) Bruss; her unabashedly favorite grandchild, Mike Bruss, and the youngest, Mark Bruss. She is great-grandmother to 9 young children with two more on the way. She is also survived by her sister, Janet (Richard) Brown of Bellair Michigan and her three nieces, Linda, Nancy and Mary. Our hope is that when Nana arrived at the gates of heaven, someone had the good sense to greet her with a Manhattan and that she was not held from entry for an extended period of time explaining her elaborate and many fibs about her age. If you notice, per her command, there is no age at passing or year of birth in this publishing.